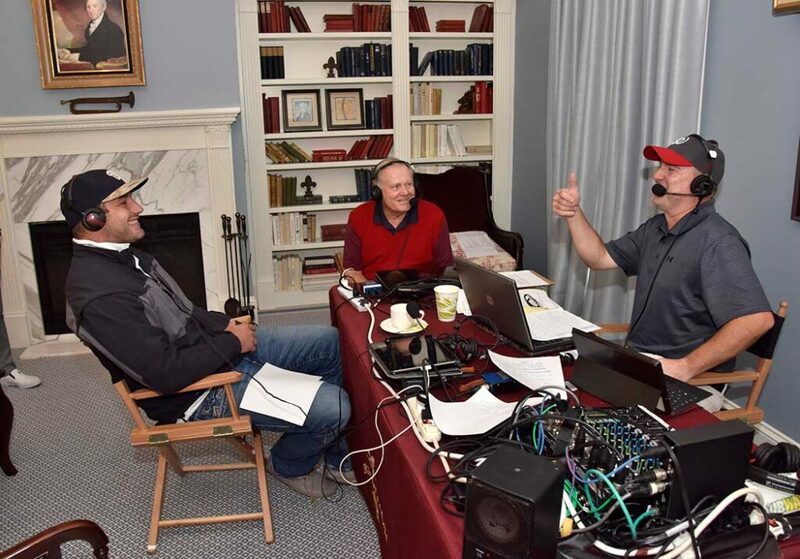 Below are excerpts from Jack Nicklaus’ interview on ESPN 980 live from the Creighton Farms Invitational with co-hosts Chris Cooley and Kevin Sheehan. ESPN 980: Thirty years ago in April we celebrated the 1986 Masters anniversary. We are live from the Creighton Farms Invitational hosted by Jack Nicklaus and benefitting the Children’s National Heart Institute and the Nicklaus Children’s Health Care Foundation. Chris Cooley, Kevin Sheehan out here at Creighton Farms with Jack Nicklaus, the 18-time major champion and one of the great sports champions of all time. Jack, I know this event is very important to you and your wife, Barbara. Tell us about it and how important it is, and why you’re so involved. JACK: Barbara and I said a long time ago that if we were in a position to help somebody, it would be kids. So when we started the Memorial Tournament (in Columbus, OH), Nationwide Children’s Hospital, which saved my daughter’s life when she was less than a year old, was the beneficiary from day one. Then, we went to Florida, and we started our Foundation and we’ve been the beneficiary of The Honda Classic. We felt like we had the ability to help people not just on a local basis, but on a national basis. We did the golf course at Creighton Farms around 10 years ago and David Southworth came to us and said, “We’d like to do something like this, can we do something with kids?” So this is the fifth year that we’ve done a fundraiser up here to benefit kids in the area, and this just extends our reach to be able to go out and help kids not only in Florida and Ohio, but in all areas. ESPN 980: You guys have done a heck of a job. You’ve also done a heck of a job with the golf course. This is my favorite course in the entire D.C. area. The head coach of the Redskins plays here and I get to spend quite a bit of time out here. What goes into putting a course like this together? Because you’ve designed many courses, and you’ve just done such a magnificent job. JACK: Well, thank you, Chris. A fellow named Jim Brown is the one that brought this project to us. He’s one of the owners and he’s been a builder here for years. He had this property with a high side for a clubhouse, and a valley, and some wetlands that ran through it, and then the hill side on the other side. So what you do is you take what you’re given, and you start working with it. Of course, you know, we worked the course into the hills. We worked down into the wetland area—across them, along them, and back up on the hills on the other side. We had some tree areas. You just take what you’ve got, and you work it out. You try to figure out the two things that I use as the philosophy to do a golf course. The first is that most people are really interested in something being aesthetically pleasing and good to the eye. The second is that a good golfer likes good golf shots. So if you design something pretty with good golf shots in it, then I think that’s the combination that creates a really nice golf course. JACK: We had a green up there, and it was originally planned with a lot behind the green. We were in sort of the edge of the hillside. They took the lot away and decided not to put it there. Now, we’ve been able to move the green back into the hillside a little bit, and create some more space. We do that a lot. We’re not perfect every time. We make mistakes just like everybody else. But, we stay on top of it, and we stay with it, and we make sure we get it right. ESPN 980: We’re talking to Jack Nicklaus. Before we get to golf, I think this is really fun, because you put the other emphasis on your family. I have kids, and as a football player, we’ll make them golfers. Your grandson is playing tight end for the Buffalo Bills and I think this is just a fun conversation. He’s a heck of a player, Nick O’Leary—no gloves; tough guy. JACK: He’s a tough kid. My son Steve played for Florida State back when he was a kid. He’s in his 50’s now. Then, Nick came along, and his father played at Georgia as a tight end. Nick is a tough kid. He doesn’t use gloves. It’s freezing outside and he’s obviously wearing short sleeves like all the other guys that let their “guns” stick out. He loves to compete. His work ethic is fantastic, and that’s what I like about him. He works, and works, and works; and if he has to get better, he gets better. ESPN 980: Yeah, and it seems like he has gotten better as he’s come into the League. He was a great double move guy at Florida State—he kind of out-and-upped stuff. He was really good at selling everything. Question for you about the gloves—does he play golf with a glove? JACK: I’ll tell you a true story. Back when I was doing some commercials, I was doing a shoot for RBS, and they said, “We need three of your grandkids to play golf.” I said, “I can get a couple of them to play.” They said, “Well, we need three.” I said, “Oh, well, we have Billy, and Charlie—get Nick. Nick never played golf before, but he won’t embarrass anybody.” He was 12 years old at the time. So we went out and did the commercial, and at the end of the commercial, Nick said, “That was fun. I hit the golf ball, and I’ve never done that before.” And he hadn’t—they went out and played two or three holes. The next day, Nick said, “I’m going to play 18 holes of golf.” He was at The Bear’s Club, which is a pretty strong golf course, and he played a round from the member tees. The first time he ever played, Nick shot 77. ESPN 980: Oh my God. At 12?! JACK: 12 years old, first round of golf. ESPN 980: Genetics played into that. How did he not pick up a golf club until he was 12, being related to you? I didn’t push any of my kids into golf, and they played golf because they wanted to. I think my boys handled it pretty much the same way with their children, but my grandsons all ended up playing football or lacrosse. I have a couple that are in college playing lacrosse. It’s great and it’s fun. But they all also play golf a little bit. ESPN 980: It’s got to be one of the greatest rounds of golf, playing with your sons. If you had three of four that are golf pros, it’s got to be phenomenal. Or is it? Because I hear guys talk about playing with their fathers and they say, “Dad’s always criticizing me.” So what is a round of golf like with your family? JACK: Well, we don’t play golf often because they don’t play that much anymore—because their kids don’t play. It’s like anything else—fathers these days end up in the parks on the weekends and they have their kids into lacrosse or soccer or whatever it might be. So my boys don’t play as much as they used to, but when we do go out and play, it gets competitive, that’s for sure—there’s no question about it. I play the Father/Son every year on the PGA TOUR Champions. I split it between Jackie and Gary as my playing partners. They’re both good players, and it’s Jackie’s turn this year. We also play a Father/Son at home and I play with Steve, too. I try to mix it up. We play two or three times a year, but that’s about it. ESPN 980: You know, kids are always so different even though they come from the same set of parents. Were yours wired the same competitively, like you? JACK: No, they’re all different. Jackie was very competitive. He was a tough kid—a little bit like Nick. Steve was sort of a finesse guy. He was a little bit like Nick—if he could touch it, he’d catch it. He played wide receiver at Florida State. Then, Gary came along and Gary was more my size. Jackie and Steve are taller. We called Gary “Little Herschel” when he was in middle school—but then he didn’t grow any taller. He ended up playing golf and being a really nice golfer. He played on the TOUR for a few years. Then, Michael came along and he played a little bit of everything. He went to Georgia Tech on a golf scholarship. Actually, I’m really proud that all five of my kids went to college on a D1 scholarship. So, that’s kind of fun. I love the aspect of scholarships where the school has to commit to the kid and the kid has to commit to the school. I like that a lot. ESPN 980: Did the love of football all stem from a love for Ohio State football? JACK: I don’t know. Jackie went to North Carolina. Steve went to Florida State. Nan went to Georgia on a volleyball scholarship. Gary went to Ohio State. Michael went to Georgia Tech. So, they all went to different schools and all did different things. They’re about as different for five kids as you’ll ever see. They don’t do anything the same. But I’ll tell you one thing, they all do love to hunt and fish. When they get together, I think that’s what they get together more for than anything else. ESPN 980: Eighteen-time major championship—19 seconds is even more remarkable. By the way, Tiger Woods is back in the news because he’s going to play, apparently, in October. Do you ever get sick of the Tiger questions? JACK: Well, I suppose I get a lot of questions about Tiger. But Tiger Woods is a tremendous talent. He plays well. He has a great work ethic. He’s probably as talented of a golfer as anyone who’s ever played. He’s been unlucky with his body. I don’t know whether some of it is self-induced or some of it is just unlucky. But we never know what happens with guys. Tiger is coming back this fall. I’ve firmly said that he will start to play well again. The only thing is what’s in between his ears right now: Can he believe that he can play? And can he believe that he can get back at the level he was? You know, he’s 40 years old right now. Will he get back to that level? Probably not. But will he get back to a good level? I think so. I think he’s a determined young man who really wants to play. ESPN 980: The level of psyche you have to be in is absolutely incredible. One of the things I wanted to ask you about is, watching all these young golfers, there’s a lot of talent. But you watch everything around them, and they work out so much more. All these guys have these workout routines and with Tiger, it’s the same. Tiger talked to us a couple months ago about how hard he works out. Do you think that helps you be a better golfer? It gets you in shape and obviously you want to look good. But I think it might hinder your golf game a little bit. JACK: You know, when I look back on when I grew up, not even football players lifted weights. That was back 50 years ago. None of the guys did anything. We never did anything. I never really got into the workout room until I was about 40 years old. I was pretty strong and I didn’t think I needed that much. ESPN 980: Yeah, I’m sure you got a lot of looks. JACK: That’s exactly right. So anyway, it was fun and that’s what I did. But athletes today get into a single-minded, one sport routine. I can’t stand it. ESPN 980: I can’t stand it either because I played as many sports as I could growing up, and I don’t even know why coaches will allow it. Because I think you can become a better player in whatever sport you’re playing by playing another sport. ESPN 980: Basketball and lacrosse, the sports your grandkids play, those make you so much better at the other sports. JACK: I think so. You get the kids today into the sport, and then they can’t get to the “next level.” I mean, come on, that’s a bunch of junk. ESPN 980: It is a bunch of junk. What helped me be the type of football player that I was is I watched guys that played basketball. They could go up and get a ball in the air like a rebounder. I think baseball gives guys situational awareness that can be applied in football games. There are so many aspects. None of the other sports have helped me in golf, though, so if I had a single-minded focus, I would focus on golf for a while. JACK: What’s interesting about golf is that most athletes end up gravitating toward golf because it is such a difficult sport. If a guy is a good athlete, he’ll end up being a pretty decent golfer if he just takes it up. But you never master it; even the best players in the world never master the game. You’re always struggling because you’re not playing on a 53-and-a-third by a 120-yard field. You’re not playing on a baseball diamond. With golf, every field is different and every atmosphere is different. The grass is different. The weather is different. You’re outside. You’re not in a stadium. There are so many different variables, so you never master golf. So, I think good athletes like a challenge. ESPN 980: Is it also because golf is more of a learned skill than an athletic feat? JACK: I think it’s a little bit of both. You’re not going to tell me that you’re going to find a person who’s not a very good athlete and he or she is going to be a great player. But anyone can play the game. That’s the nice thing about the game. You don’t really have to be a world-class athlete to play the sport and have fun because of handicap systems. Players can go out with an 18-handicap and play alongside a scratch golfer and they can have fun. Age doesn’t make a difference either. Whether you’re 20 or 70, you can still play together. There are so many different things you can do with golf that you can’t do in other sports. ESPN 980: I have one goal when I golf, and that’s not to beat anyone I play with, for the most part. It’s for whatever I need to score or want to score on that day. And I think that’s what makes golf competitive because I’m just competing mostly with myself. ESPN 980: That’s a good strategy. Well, it’s a beautiful tournament out here at Creighton Farms. It’s a beautiful day. Jack, I can’t tell you how honored I am that you sat down with us. It’s such a blessing. ESPN 980: And we’ll be watching Nick tonight. JACK: Yep! I’m going there [to Buffalo] right after here. ESPN 980: Oh, you are? JACK: Absolutely. I don’t miss many of them. ESPN 980:Jack, thanks so much. ESPN 980: Jack Nicklaus. We’re live from his event benefitting the Children’s National Heart Institute and the Nicklaus Children’s Health Care Foundation at Creighton Farms.